This appendix provides examples of signing and pavement marking from U.S. part-time shoulder use facilities. They are not necessarily compliant with the Manual on Uniform Traffic Control Devices (MUTCD) and are provided as examples of what states have done rather than guidance. CHAPTER 7 of this guide provides guidance on signing and pavement marking for agencies designing new part-time shoulder uses facilities, developed in part from the examples presented here. 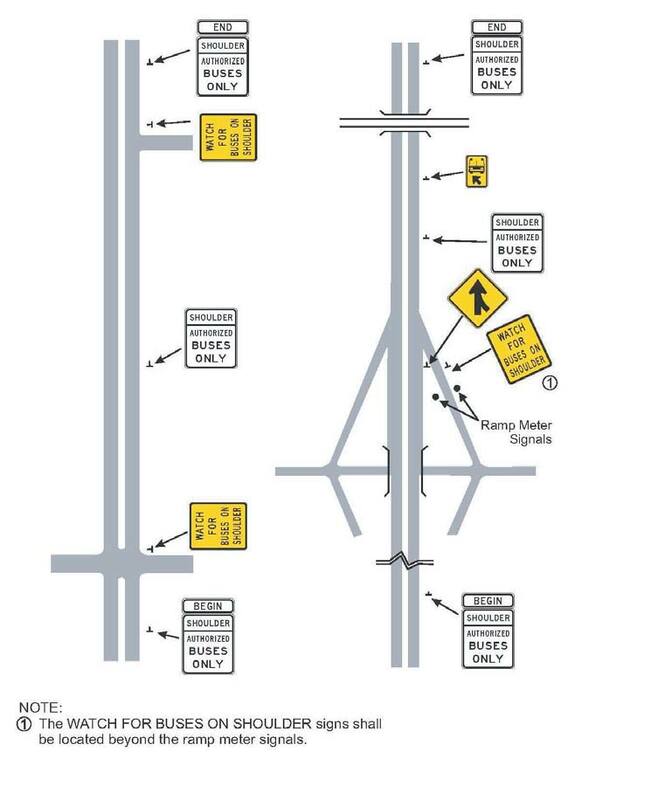 Figure 40 shows the layout of signs used for bus-on-shoulder (BOS) operation on freeways and arterials in Minnesota. Figure 37 and Figure 41 show regulatory signs for BOS operation used in Minnesota and Miami, respectively. Miami’s signs have since been modified to remove the diamond symbol, which is now exclusively for high-occupancy vehicle (HOV) lanes per the 2009 MUTCD. Figure 42 shows a typical MnDOT on-ramp warning sign for BOS operation. The white-on-black sign on the left side of the photo is a standard regulatory sign used on Minnesota regardless of whether or not the freeway has part-time shoulder uses. 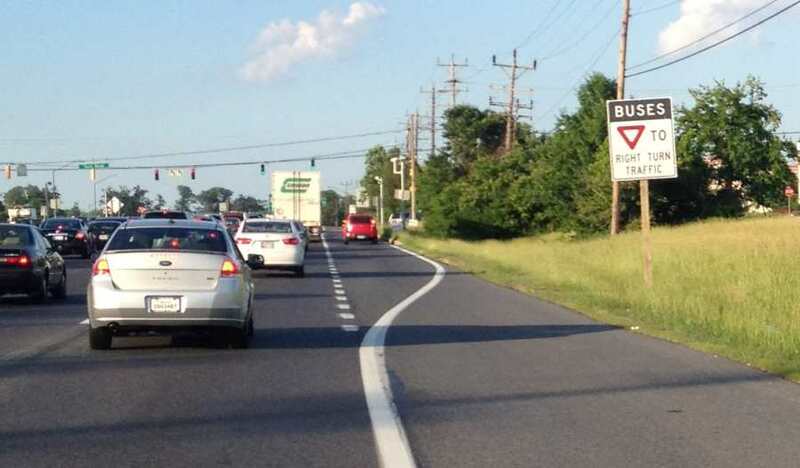 Figure 43 shows a sign from the US 29 arterial in Montgomery County, Maryland, instructing buses to yield to right-turn vehicles at the start of a right-turn lane. Figure 44 and Figure 45 show optional word pavement markings from a freeway in California and an arterial in New Jersey, respectively. 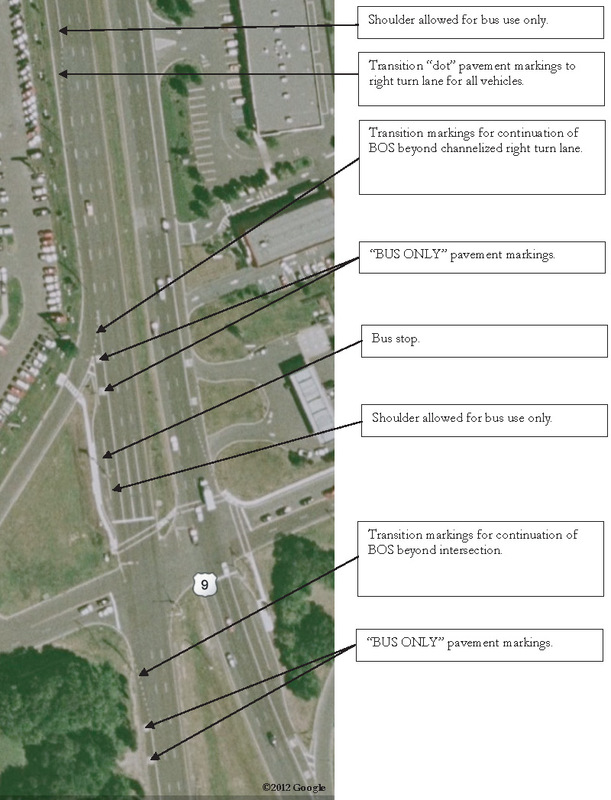 Arterials in Washington State and New Jersey are highlighted below to present examples of arterial BOS pavement markings in different contexts. SR 522 in Kenmore, Washington, is a highly developed arterial with numerous access points. A dotted edge line is used to indicate to passenger car drivers the shoulder is available as a right- turn lane in areas with many access points, and solid edge line is used in areas with fewer access points. Upstream of major access points, right-turn arrows are placed on the shoulder. Downstream of major access points, transverse white pavement markings are placed on the shoulder for approximately 50 feet followed by “transit only” word pavement markings. 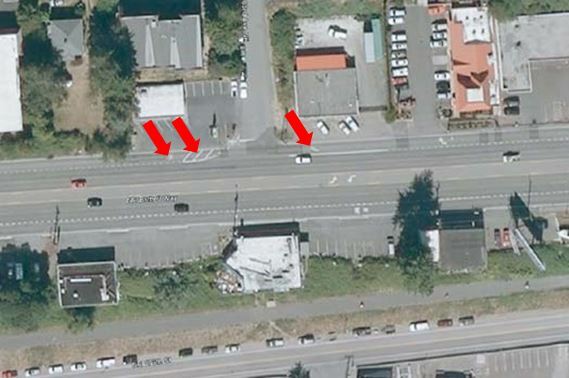 Figure 46 shows pavement markings on SR 522, with red arrows pointing to markings noted above. US 9 in Old Bridge, New Jersey, is a higher order roadway than SR 522, with fewer access points and a mixture of intersections and interchanges. 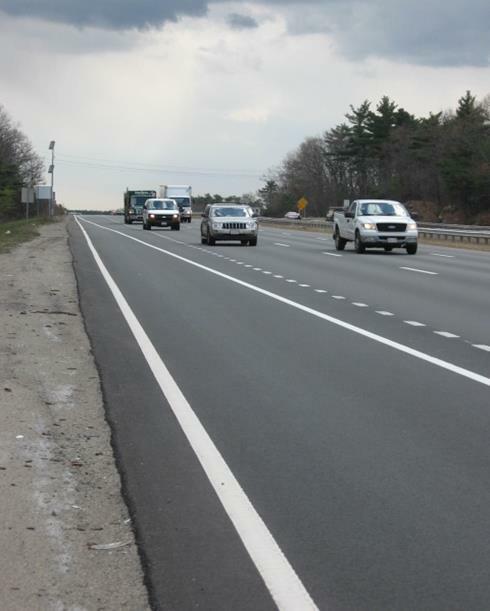 A solid white edge line is used along the majority of the roadway. Approaching major intersections, the edge line transitions into the curb using dotted white pavement markings and the shoulder space becomes a right-turn lane, with lane line markings separating the right turn lane and through lanes. Downstream of major intersections, dotted white pavement marking transitioning from the curb to a solid white edge line is used to reestablish the shoulder lane. Figure 47 shows these pavement markings. The specific intersection shown in Figure 47 has jughandles, which provides space for a bus stop and turnout upstream of the intersection. This is a relatively unique configuration that cannot be easily replicated on many arterials. Figure 47. Photo Illustration. 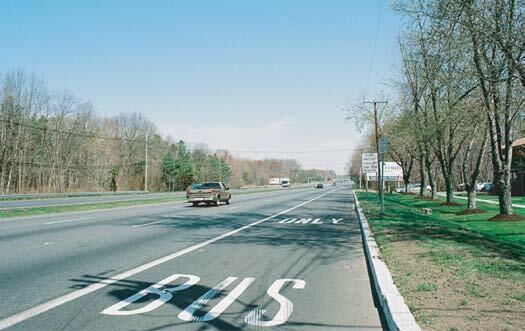 US 9 arterial Bus-on-shoulder pavement markings, New Jersey. Georgia 400 is a commuter freeway connecting Atlanta and its northern suburbs. BOS operation was implemented in the mid-2000s, and in 2012 and 2014, the southbound and northbound shoulders between three interchanges, respectively, were opened to all vehicles during peak periods. Part-time shoulder use does not extend through any interchanges and instead functions as an auxiliary lane between interchanges. GA 400 has black on yellow and white signs at the start of part-time shoulder uses segments noting the hours of operation (see Figure 48), and black on yellow warning signs along the part-time shoulder uses segments with the message “shoulder lane” and a 45 mph advisory speed limit plaque (see Figure 49). A black on white regulatory sign with the message “shoulder lane begins 1000 feet” is placed near the end of on-ramps, as shown in Figure 50. 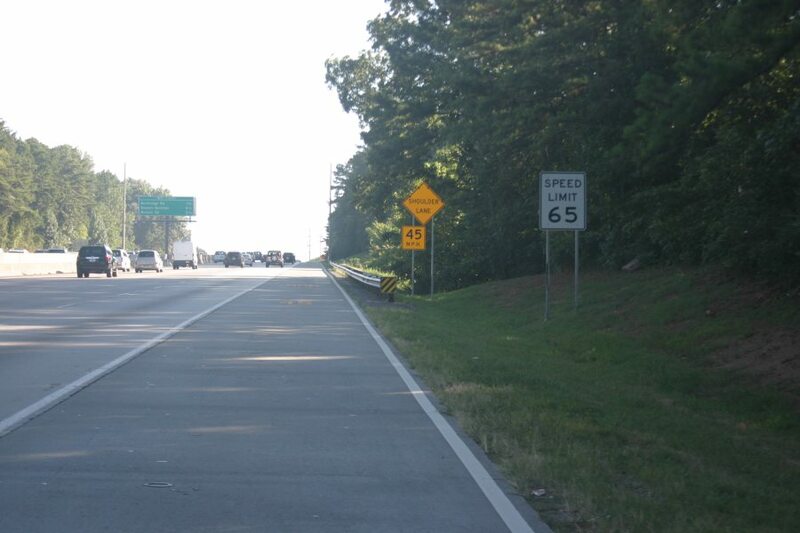 GDOT has a project underway to add dynamic signs to GA 400, and is planning another part- time shoulder use facility on I-85 that will open with dynamic signs. 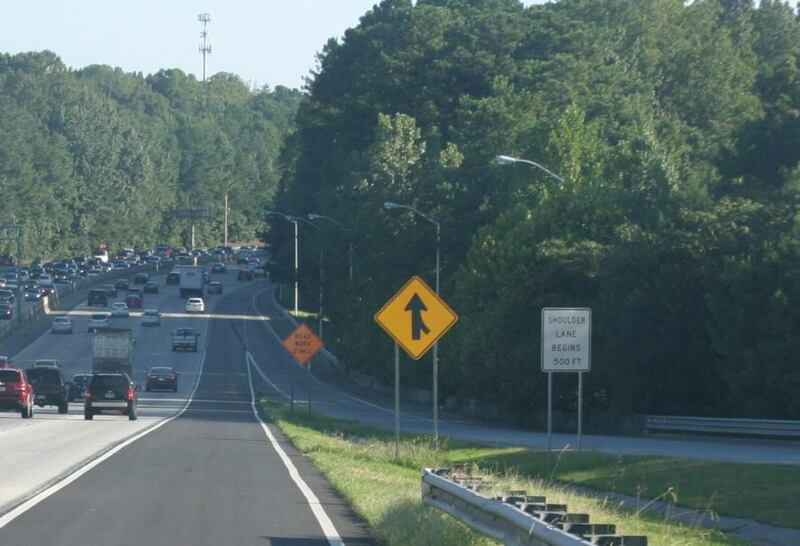 GDOT is adding dynamic signs to enable closure of the shoulder when disabled vehicles are stopped on it, and to more easily modify the set hours of operation. 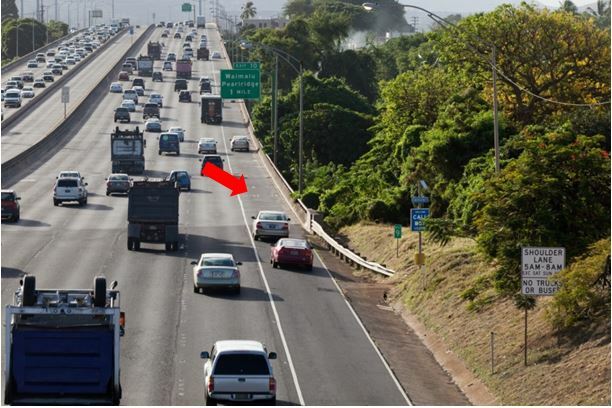 Interstate H-1 in Hawaii employs static part-time shoulder use in the eastbound direction that operates during the a.m. peak period. Like Georgia’s shoulder lane, it functions as an auxiliary lane between interchanges and does not run through interchanges. 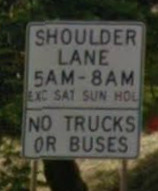 Ground mounted, two-section black on white regulatory signs with the messages “shoulder lane 5 AM – 8 AM exc. Sat Sun Hol” and “no trucks or buses” are used along the route; an example is shown in Figure51. Similar signs are used at the start and end of segments and along ramps. Figure 52 shows signs on on-ramps and off-ramps. 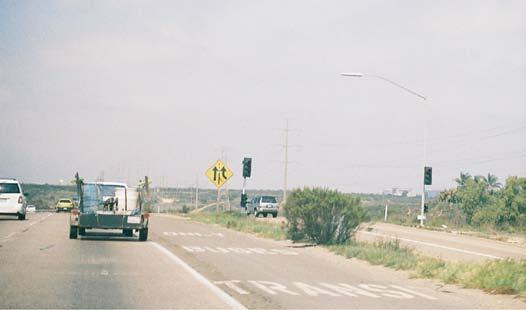 On I-H-1, signs are used on off-ramps because shoulder traffic is directed onto off-ramp shoulders to form a second exit lane rather than remaining on the freeway through interchanges. In addition to eastbound part-time shoulder use, I-H-1 also has a moveable zipper barrier that is used to reduce westbound lanes and increase eastbound lanes during the a.m. peak hour. I-H-1 has dynamic signs to regulate use lanes created with the moveable barrier, but they do not communicate information related to part-time shoulder use. Massachusetts uses a mix of black on white regulatory signs and black on yellow warning signs. 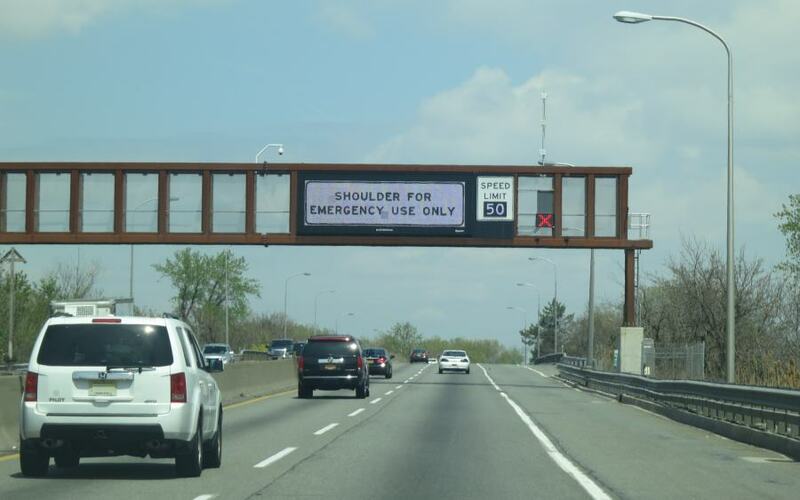 MassDOT initially implemented part-time shoulder use in 1985 with static signs at the start of part-time shoulder use segments, after on-ramps, and at the end of part-time shoulder uses segments. 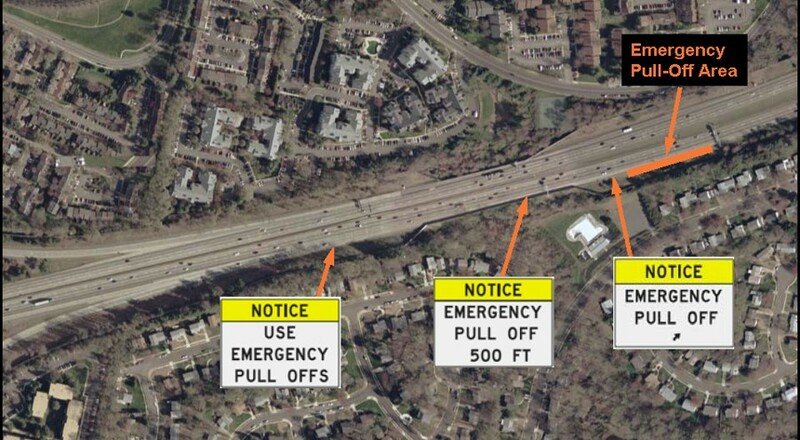 In the early months and years of operation, warning signs were added to on-ramps and “Mon - Fri” was added beneath the hours of operation; an example is shown in Figure 54. Prior to the addition of “Mon – Fri”, some drivers were using the shoulder on weekends. 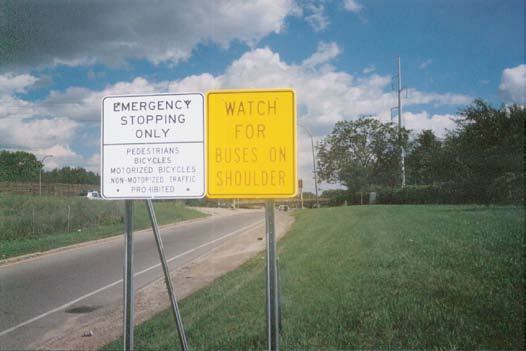 In 1999, MassDOT replaced the static signs, which were nearly 25 years old, on two of the three part-time shoulder use facilities. 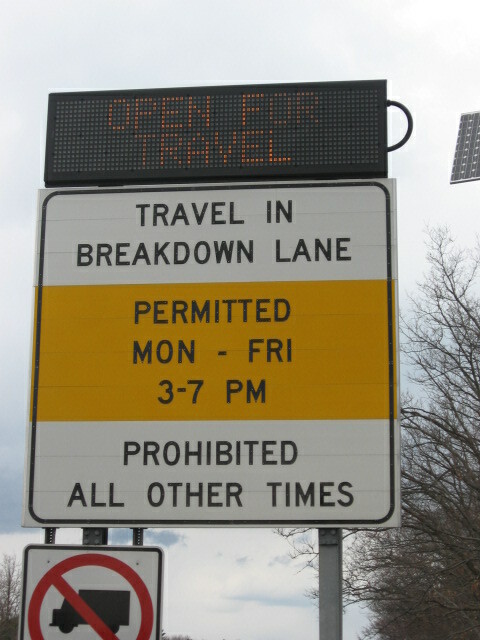 As part of the replacement, MassDOT added a dynamic panel to some of the static signs that displays “open” or “closed”. The primary purpose of adding the dynamic panel was to provide a clearer message to drivers. 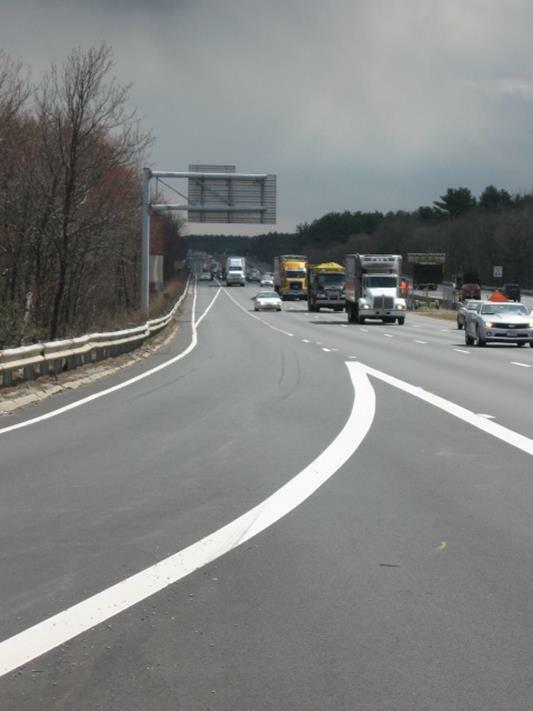 The dynamic panel also creates the opportunity to open shoulders outside of regularly scheduled hours, and MassDOT has done this when construction closes general purpose lanes. Figure 55 illustrates the signing detail of the new dynamic signing. These hybrid signs are located at the start of the permitted part-time shoulder uses lanes and after every on-ramp to the freeway where shoulder running is authorized. The dynamic messaging at the top of the sign is controlled remotely by the Incident Management Division in MassDOT’s Highway Operations Center. 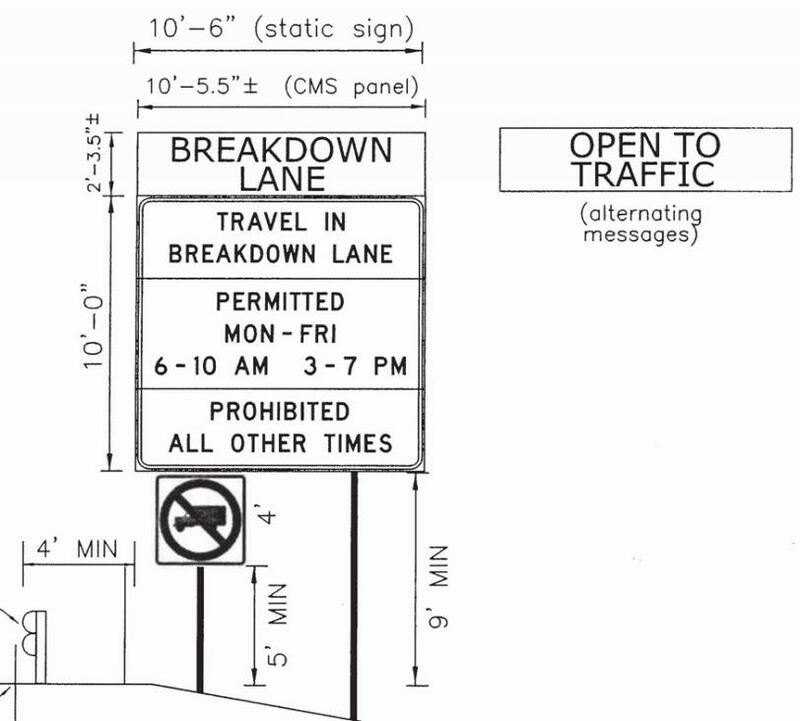 The varied messaging that can be displayed on these dynamic signs to inform travelers about the lane’s current functionality are shown in Figure 56 and Figure 57. SR 29 in New Jersey employs static part-time shoulder use in the westbound direction that operates during the a.m. peak period. 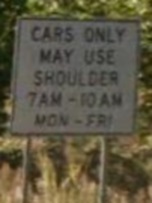 Ground-mounted black-on-white regulatory signs with the message “cars only may use shoulder 7 AM – 10 AM Mon-Fri” are placed along the route, as shown in Figure 58. Similar signs state the shoulder is only for access to SR 129, the right-hand side of a major fork at the end of the part-time shoulder use segment. There is one portable variable message sign at the start of the segment that supplements the static signs and informs drivers when the shoulder is open to traffic. 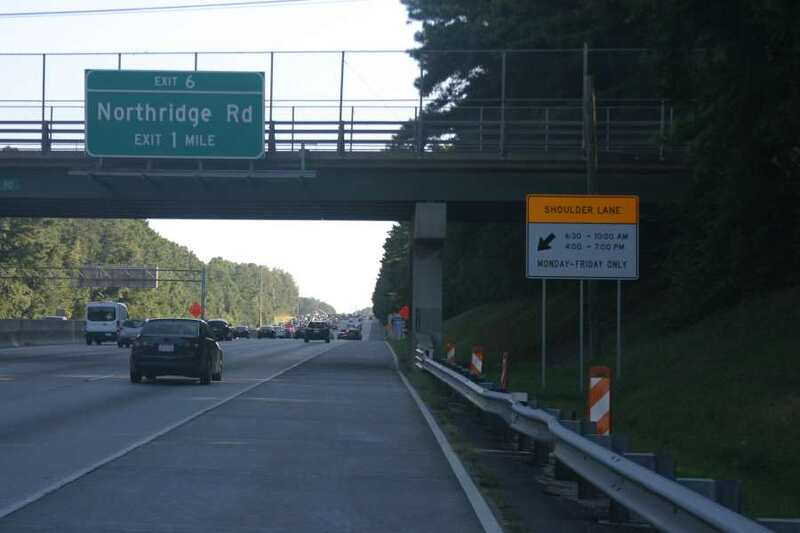 Virginia’s initial static part-time shoulder use facilities—I-66 in suburban Washington and I-264 in Virginia Beach—were both implemented in the early 1990s and uses similar signs. 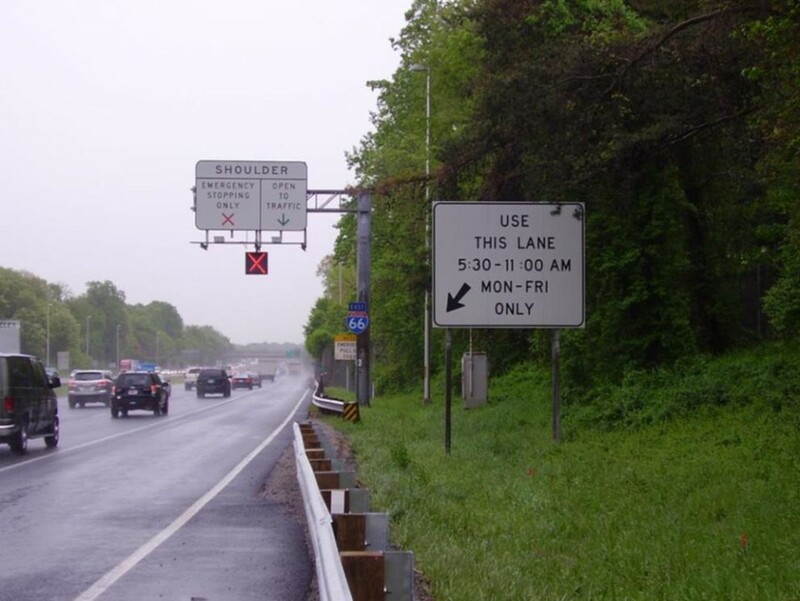 The shoulders on I-66 were converted to dynamic part-time shoulder use in 2015, and signing changed. Both facilities used black on white regulatory signs. Overhead signs had a dynamic section that displayed a red “x” when the shoulder was closed to traffic and green arrow when it was open the traffic. Ground mounted static signs listed the hours of the operation and other regulatory information. 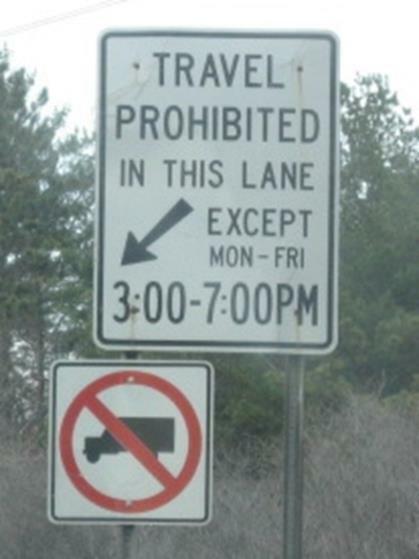 The shoulder was opened and closed on a fixed schedule, but operators could override the schedule and change dynamic indications if special conditions warranted opening or closing the lane outside of scheduled hours. 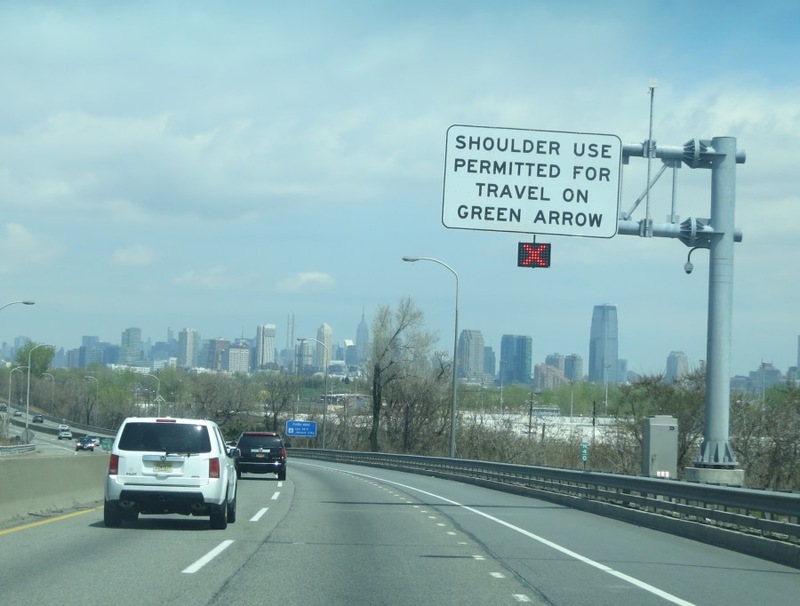 For travelers on the mainline, a combination of overhead and post-mounted signage denoted the start of permitted part-time shoulder uses, shown in Figure 61. Post-mounted signs displaying the hours of permitted shoulder use were spaced approximately every quarter mile throughout the corridor. Subsequent signs provided notice that there was no physical shoulder during the prescribed hours of shoulder use, shown in Figure 62. While the shoulder was not in use, drivers were permitted to use the shoulder to exit the freeway a few hundred feet in advance of the gore point; Figure 63 illustrates the post-mounted, static signage used to inform motorist where they were permitted to begin exiting. Figure 63. Photo. 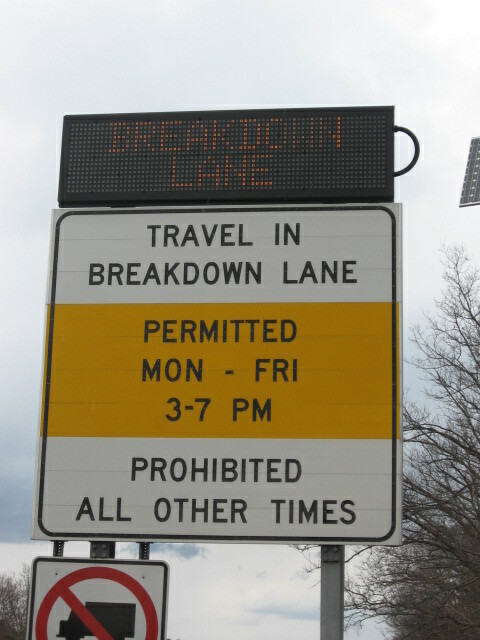 Static signage denoting permitted use of shoulder to exit during non-operational hours of shoulder use, I-66 mainline. 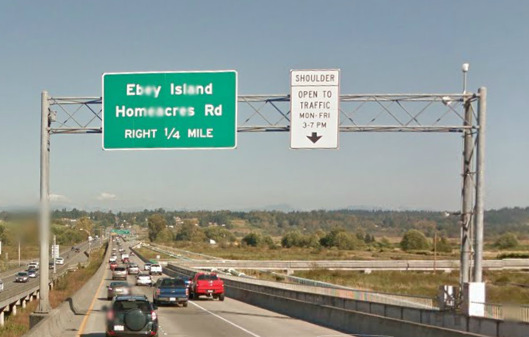 Part-time shoulder use was implemented on US 2 eastbound in Everett, Washington, in 2009 on a trestle crossing wetlands. WSDOT used static signs to reduce the project cost and initially planned to implement dynamic signs at a later date. As of 2015, the static signs are working effectively and WSDOT no longer plans to implement dynamic signs. The US 2 part-time shoulder use segment is a commuter-oriented facility on a bridge with few ramps and minimal curvature, signs, and other elements that would increase driver workload. This makes it a good candidate for having static signs only. (33) Figure 64 shows an overhead regulatory sign on US 2 at the start of the part-time shoulder use segment. Ground mounted regulatory signs are used within the part-time shoulder use segment. Washington previously allowed buses and HOVs (with three or more passengers) to travel on the shoulder of westbound SR 520 approaching Lake Washington at all times. It was frequently described as static part-time shoulder use, but it was not in the sense it was never available for emergency refuge and always open to traffic. The lane was signed with static black on white regulatory signs prior to its replacement with a general purpose lane in 2015 as part of a roadway widening project. Figure 65 shows the turnout sign sequence current in use in Virginia. Massachusetts uses one small black on white sign at the start of the turnout and does not provide any advance signs. For consistency with other types of roadside refuge areas such as slow moving truck turn offs on rural two-lane highways, the term “turnout” is preferred over “pull off”. Figure 66 shows the use of two edge lines on I-H-1 in Hawaii, with the outside edge line terminating at the start of the bridge. “Shldr lane” word markings are provided (see red arrow). At the start and end of part-time shoulder use segments, the line between the shoulder and the adjacent travel lane typically changes from solid white to dotted white to encourage travel onto/off of the shoulder. Sometimes diagonal solid or dotted lines are used to further guide the transition. Figure 67 shows pavement markings at the start of the part-time shoulder use segment of US 2 in Washington State. Pavement markings at on- and off-ramp are more complex. They vary based on the types of entrance and exit configurations described in the geometric design section of this chapter, and existing state ramp-freeway junction marking practices. In general, pavement markings in the vicinity of a merge or diverge should provide a clear means for drivers on the mainline shoulder to pass through the ramp freeway junction, and they should also provide a means to transfer from the freeway to ramp or vise verse. Striping can create parallel or taper style merges and diverges. 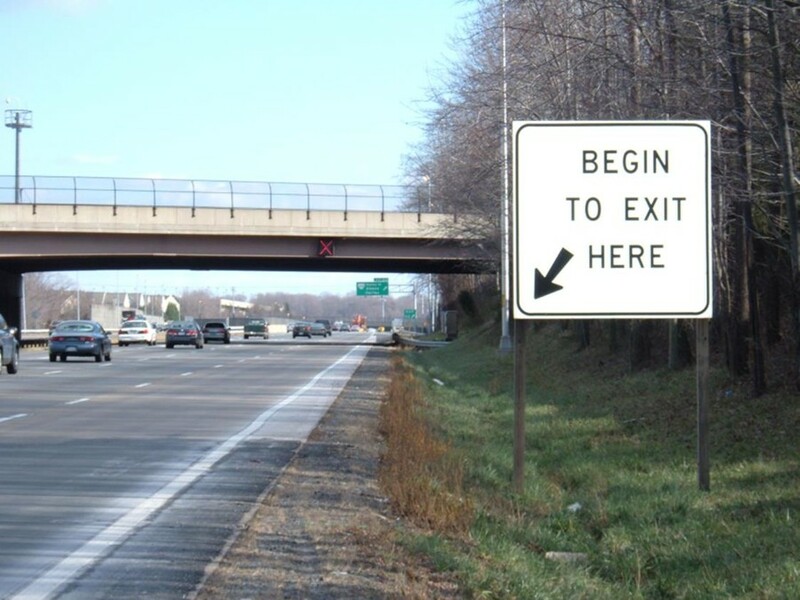 MassDOT uses parallel style entrances and exits on part-time shoulder use facilities. 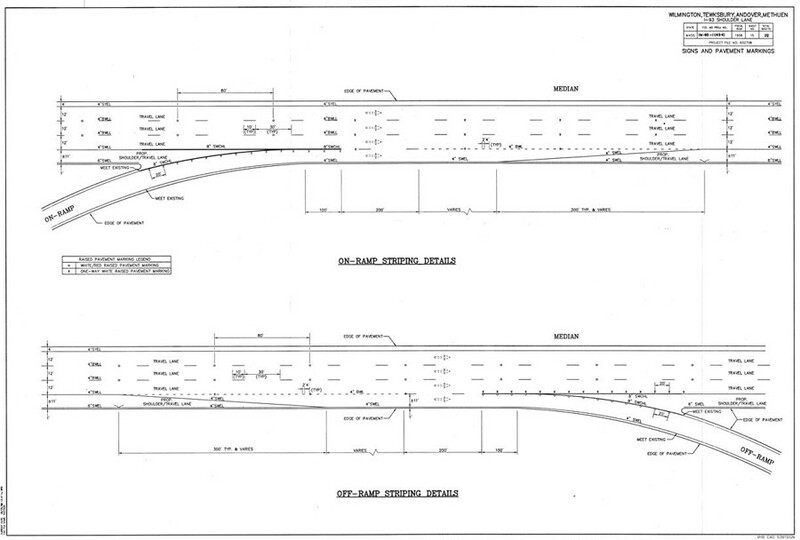 Figure 68 illustrates the typical striping plans for part-time shoulder use at ramps on I-93 in Boston. The painted gore at on-ramps is used to terminate the exclusive use of the shoulder lane, allowing vehicles entering the freeway to drive on the shoulder for several hundred feet and then merge with the general purpose lanes. The acceleration lane for merging traffic is tapered down, and part-time shoulder use is resumed. Figure 69 shows an example of this merge; the solid white lines denote the shoulder, which reaches full-width after the acceleration lane is eliminated via the taper. At off-ramps, a single solid line is used to transition traffic from general purpose lanes onto the shoulder, allowing general purpose traffic to exit. Part-time shoulder use resumes beyond the painted gore; Figure 70 illustrates an example of this transition. On I-66 in Virginia, the pavement markings for part-time shoulder use are carried through the on- and off-ramps. Vehicles from the general purpose lanes use a short portion of the shoulder to access the off-ramp, which is a taper-style design. Past the painted gore of the off-ramp, the shoulder lane again becomes a part-time lane.